Around 70% of brides wear their diamond rings on their left hand's fourth finger. Learn how to pick out other bridal jewelry pieces to make your wedding look pop. In the United States, about 17 tons of gold gets turned into wedding rings each year. However, other metals might look better with your dress. Certain wedding jewelry styles seem like default choices, but there are so many options out there to choose from. When it comes to selecting bridal jewelry, you must take your dress into consideration. The more elaborate your dress is, the less elaborate your jewelry should be. Adopt "less is more" as a mantra for choosing your wedding day jewelry. Even understated jewelry can revolutionize your look. If you want to look at different kinds of jewelry, view here. Don't wear too much jewelry. Accessorizing every part of your body will take the attention away from your dress. If you want to save money, borrow jewelry from relatives or friends. Buying is a better option if you want to keep the jewelry as a memento. Consider your wedding's theme when choosing jewelry. If you're having a Hawaiian wedding, flowers might suit you better than jewels. Different types of metal complement different styles of wedding dresses. Make sure your jewelry metal doesn't clash with the metals in your engagement ring and wedding ring. White gowns look best with silver or platinum pieces. Gold jewelry enhances the look of ivory and champagne wedding dresses. Rose gold goes with blush-colored dresses. If you want to play it safe, go with a white pearl necklace. It's especially stylish if the pearls match the beading on your wedding gown. The type of necklace you should choose depends on your wedding dress's neckline. If your dress has a strapless or sweetheart neckline, wear a shorter necklace or a choker. Consider not wearing a necklace and opting for classic chandelier earrings instead. If you have a V-neck wedding dress, layer a choker and a slightly longer pendant necklace. The look will emphasize your neck. The only necklace that goes with a halter or reverse halter wedding dress is a choker. However, a choker might make your neck look shorter. Instead, decorate your hair with vines, pins, combs, jewels, flowers and more. Only wear jewelry pieces you're authentically attracted to. Don't just wear a bridal jewelry piece because you think it'll impress others. The jewelry you choose for your wedding day should be a reflection of you. 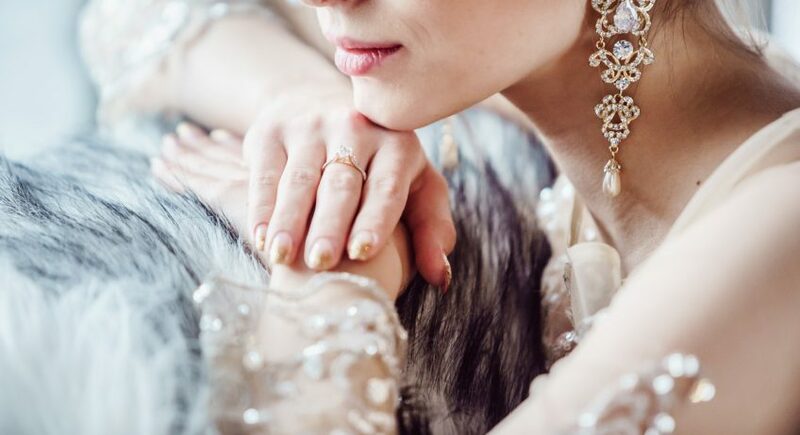 If you're not comfortable wearing a certain piece of jewelry, it'll add more stress to your wedding day. De Beers, a British company that managed diamond mines, launched a major advertising campaign to convince young men to associate diamonds with love. In the case of bridal jewelry, there's so much more than diamonds out there. De Beers coined the slogan, "Diamonds are forever." However, in the scheme of a wedding, a diamond ring is only a single piece of jewelry. The other pieces of bridal jewelry you choose also contribute to your wedding look. Prepare for your big day and learn more about weddings. The more you learn, the better your wedding will be.